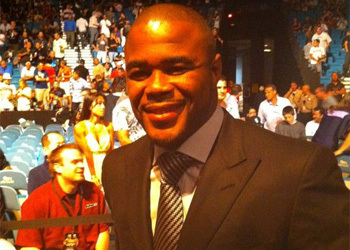 Nearly 10 full months will have passed by the time former 205-pound champion Rashad Evans will step into the Octagon to challenge reigning king Mauricio “Shogun” Rua for his belt. Now that Shogun is ready to return from his third knee surgery, Octagon brass have tentatively scheduled his first title defense for UFC 128 on March 19th in New Jersey. D-day can’t come soon enough for the former “The Ultimate Fighter” winner. “Shogun’s healthy again, that’s great. I finally get a chance to get back in there and fight,” Evans said while appearing on TapouT Radio. The talented Brazilian went under the knife this past June. There was chatter of a potential interim title belt due to Rua’s extended absence, but UFC president Dana White felt it didn’t make sense and quickly shot the prospects down. After easily outpointing Quinton “Rampage” Jackson at UFC 114 this past May, the always confident wrestler opted to sit the sidelines and wait for his shot at the crown. Many critics were quick to question Evans’ decision to ride the pine while Rua waited for his damaged wheel mend. Those weren’t the only detractors that shared their opinions. Despite his impressive 15-1-1 professional record and former championship status, keyboard warriors were dumbfounded as to why “Sugar” got such a sweet deal after merely posting two consecutive unanimous decision victories. “I swear, the MMA fans, I cannot win their hearts,” said Evans, who has come to terms with the fact he’ll never be an Octagon-favorite. If Evans can walk out of the Prudential Center with 12-pounds of gold around his waist, he’ll once again silence those who doubted him. Well, at least for the time being.